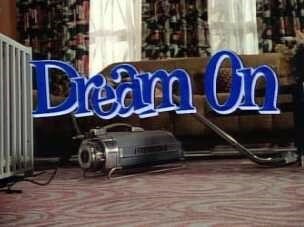 Martin Tupper, as the main title sequence of 1990’s Dream On demonstrates, is squarely within Dennis Leary’s “TV Generation.” We see the legs of a 1950s housewife as she plops her baby down in front of the black-and-white television set. Three different kids play the growing Martin, as he stares transfixed at the set over the years. As the sequence ends, we find adult Martin (Brian Benben) asleep in a recliner as a heavy-set maid with a nonspecific accent dusts his face. The premise, we understand from the start, is that Martin’s mind drifts to clips from old movies as he goes about his life. With that out of the way, the job of the pilot is to help us get to know our protagonist. There is nothing too remarkable about Martin; he’s in his mid-30s and separated from his wife, with whom he shares custody of a 10-year-old son. His current predicament arises out of that situation. His ex-wife, Judith (Wendie Malick) wants him to finally sign their divorce papers so that she can marry her live-in boyfriend. To care about a character, we need more than his demographics; we have to get to know his strengths and his vulnerabilities. Martin is all vulnerabilities. (Unless you count delusional optimism as a strength.) He’s a big wuss, who’s both afraid to end his marriage and afraid to clearly articulate his true feelings for his wife. During the 2004 election cycle we would have called him a “waffler.” It’s hard to sympathize when we don’t know if their marriage was ever strong in the first place, or why it ended. We get a little background via Martin’s best friend, Eddie Charles (Dorien Wilson), a talk show host. He mentions some stuff about growing apart over time. Maybe if we had a little hint about what the relationship was like in its hey-day we could better appreciate what Martin is losing. Martin has other external problems, like a slightly crazy housekeeper and a slightly crazier executive assistant. One has to wonder if the writers hear somewhere that a male character is made funny by surrounding him with nutty women. They get nuttier–Eddie fixes Martin up with a series of three women; one turns out to be married, one is obsessively looking for a commitment, and one has a very specific fetish that makes Marin physically ill. The pilot makes a point of informing its audience that it will be pushing the envelope. It is peppered with language and sexual innuendo, sometimes as an end in itself, as with the scene where Eddie nonsensically interviews “Lawyers in Lingerie.” What was edgy in 1990 now seems kinda lame. What I find most crazy about this show is, it’s created by Marta Kauffman and David Crane, and executive produced by Kevin Bright… the ingredients for Bright Kauffman Crane, the sit-com masterminds behind Friends. (There is stock footage in Dream On of the outside of a New York apartment building that was also used in Friends.) Considering how compelling the Central Perk Six are as characters, it’s hard to believe the same people cooked up Martin Tupper et al. Then you remember that they were also responsible for Joey. The addition of the old movie clips really doesn’t do much for the show. If anything, it slows it down. But maybe this was just the gimmick it needed at the time. At the end we get a taste for what Martin, Judith, and Jeremy are like as a family. Although this scene also marks the end of their life together–Martin signs the papers–it’s understood that they will still be in each others lives, and in ours, as viewers. The scene demonstrates the show’s heart and gives a hint it might be worth continuing to watch. This entry was posted in 1990s, Comedies and tagged brian benben, bright kauffman crane, dream on, friends, hbo, wendie malick by meekthegeek. Bookmark the permalink. I once put a laugh track on a sitcom that had no jokes in it.